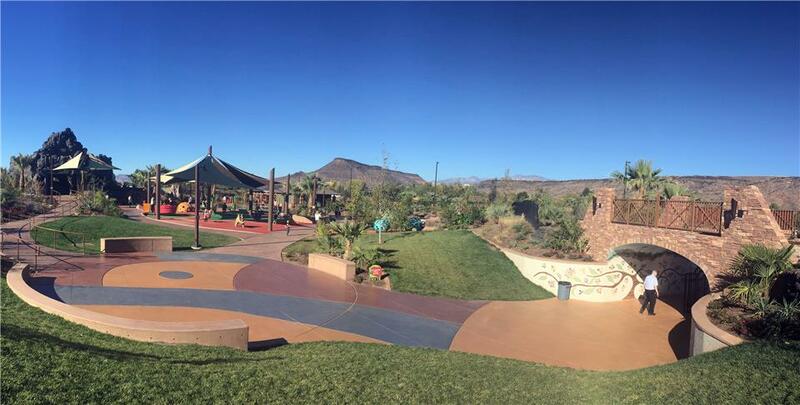 After years of planning to provide a playground people of all abilities could enjoy, the City of St. George created the dinosaur-themed Thunder Junction All Abilities Park. Among other amenities, the park includes a sound garden with outdoor musical instruments, an erupting volcano shade structure, sensory garden, waterfall splash pad area, and swing and zip-line areas with regular and high-back seats. A structure was needed to serve as both an entry to the playground and an overpass for a small train which circumnavigates the park with over 2,700 feet of track. Jviation, Inc, the project's engineer, turned to Contech Engineered Solutions for help. As the best solution, a 20' span x 10.25' rise x 16' long CON/SPAN® B-Series® Bridge System was selected and installed. "In developing the entrance to the Thunder Junction All Abilities Park, the City of St. George wanted an entrance that would provide an aesthetically pleasing bridge that had shape and character," stated Phil Giles, Project Manager at Jviation. "The City selected the CON/SPAN system, and the bridge was installed in just one day allowing the City to add a mural and cultured stones to help with the theming of the park." It was imperative that the design of the structure accommodate not only the small train loading but also electrical conduits for integrated lighting. As part of this design, the precast wingwalls were designed to extend above the headwall to facilitate a custom railing highlighting the park entrance and railroad crossing. Later, a mural was painted on the ceiling and decorative artwork was mounted to the interior of the arch and adjacent retaining walls to create a fun, playful entrance. Torch light fixtures were installed on the wingwalls to go along with the park's theme. Since opening in October 2016, the park is already fulfilling its slogan's promise of "creating miles of smiles."